Sister and brother team Bill Nowak and Gail Gentry are making hamburgers -- and profits -- together, with their two successful Checkers franchise restaurants in Buffalo, New York. At the start, Gail was no stranger to the Checkers brand: she'd worked for that company (and Taco Bell) as a district and general manager for 20 years, in Florida, before taking the plunge into ownership alongside her brother, who came from the tech sector. The two opened their first restaurant together in 2014, and their business quickly grew, without a shred of sibling rivalry. In fact, within a year, the duo were chosen "rookie of the year" by their franchisor. They also just opened their second restaurant in late October and are looking forward to expanding to "five to ten" restaurants more. 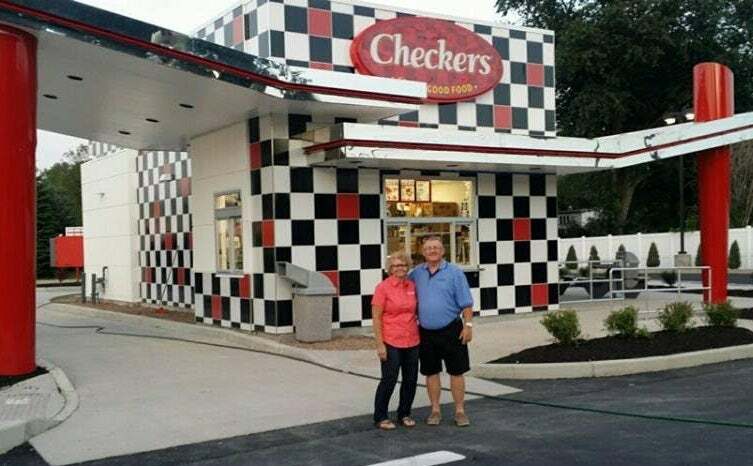 We opened our first Checkers location August 2014 and saw great success as new franchisees. We were even honored with the award of "Rookie of the Year" by Checkers at the annual national conference. It is great to know that we have exceeded many goals that Checkers expected for a first-year franchisee in a new market. Checkers has been extremely supportive and provides us all of the tools to make our business successful. Being a franchisee is a lot of work, but we can't imagine what it would be like without the Checkers team. We had talked about franchising for many years, and now it's a reality. It's the American dream. Gail was a general manager and district manager for Taco Bell and Checkers, for 20 years, in Florida. Bill was an IT consultant for 30 years. There are many reasons, the first of which was our familiarity and years of experience with the Checkers brand. We valued the many areas of quality support we receive from the franchise and the variety of amazing products we can offer our customers at a value price. We really feel like we're part of the Checkers family. The costs were more than usual, due to the manner in which we acquired the Buffalo market, but the first location cost around $950,000. Our equity input was around $325,000. The breakdown was: building/site, $575,000; equipment, $200,000; soft costs, $100,000; and startup advertising and training costs, $75,000. Gail's previous Checkers employer provided insight for us as well as did other Checkers franchisees and former business colleagues. Additionally, Internet research and many of the businesspeople we worked with in our previous careers were helpful. The information you get from unlikely sources can be very powerful. We never wanted to miss a chance to get a person to open up to regarding their business experiences, in order to learn as much as we could. The biggest hurdle for us was keeping the schedule we had initially set to open our locations. This was due to the demanding rules and regulations of the municipality, vetting and due diligence processes and utility hookups for new construction. Finally -- and this was a good challenge, but a challenge nonetheless -- the overwhelming initial response we received from our customers was beyond our expectations. Make sure you have more than enough financial backing. Hire or partner with an amazing operator that really knows how to manage that particular business. Do your homework, but also trust in your gut instincts. Live modestly, and reinvest profits to build the business. Stay involved all of the time and listen to your customers, employees, colleagues and business contacts. They will give you all of the guidance you need to adapt, improve and most of all succeed. We plan to build to satisfy the demand in the Buffalo metro area. Based on what we currently see, we're hoping to open five to ten locations.